Saks Fifth Avenue: Up to 40% off designer sale. Two things: these shoes and this handbag. Done. Nordstrom: A lot added to the sale! ASOS: 30% off ALL of it with code GIMMEMORE. Neiman Marcus + Cusp: Earn up to a $500 gift card with your purchase. Tuckernuck: 15% off site-wide with code CYBER15, 20% off orders of $150+ with code CYBER20, 25% off orders of $500+ with code CYBER25 and 30% off orders of $1,000+ with code CYBER30. Joie: Spend $250, receive 25% off; spend $500, receive 30% off - no code necessary. Tory Burch: spend $300, receive 20% off; spend $500, receive 25% off; spend $750, receive 30% off with code HOLIDAY. Lulu & Georgia: 30% off all orders of $50+ with code THANKS30. Serena & Lily: 20% off plus free shipping on everything with code THANKS20. This sconce would be an amazing addition to our bedroom. BaubleBar: 20% off site-wide with code CYBER20. Design Darling: 20% off site-wide with code THANKS. Hudson + Bleecker: 35% off site-wide with code BLACKFRIDAY35. This garment bag from one of my holiday gift guides will be mine. Sisco + Berluti: 50% off select styles with code SB50. Dying for this pretty stack! Melanie Auld: 50% off site-wide Black Friday through Cyber Monday! And yes, she has my favorite necklace in stock. I've always wanted a checkered jacket, but I couldn't find one anywhere that didn't make me look like a mountain man. This version is so cute! I am so obsessed with this coat. The entire outfit makes me ridiculously happy. P.S. Debating on buying those boots on Joie before their sale ends.... HELP! I'm broke. there will always be a place in my heart for the buffalo plaid check pattern- it's so timeless to me! That coat looks perfect on you! I've always wanted a flannel shirt in that buffalo check plaid, love it. The over the knee boots are great too. 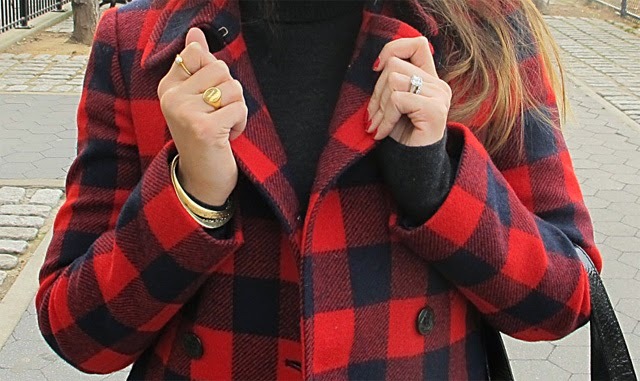 Love your plaid peacoat! So pretty!